Dateline 1999: David Kullivan a forestry/wildlife student at Louisiana State University tells faculty that while turkey hunting in the Pearl River Wildlife Management Area, a pair of ivory-billed woodpeckers foraged in trees as close as 10-yards from him. Soon after, an expert-avian search team fielded in part by the Cornell Lab of Ornithology and funded largely by Zeiss Optics hit the woods to track down this fabled icon of southern bottomland hardwood forests. After weeks of searching, the search team was left scratching their heads as the ethereal Lord God Bird once again vanished into the impenetrable swamp. Dateline 2000-2004: zzzzzzzzzzzzzzzzzzzzzzzzzzzz… For most, thoughts of ivorybills had faded back into the foggy swamps. May 2005: Not to be outdone, Auburn ornithologist Geoff Hill and students find ivory-billed woodpeckers on the Choctawhatchee River in the Florida Panhandle. In fact, Hill estimated that there were likely at least nine pairs of ivorybills in the Choctawhatchee. David Luneau on 25 April 2004. In total, the Cornell search team spent 35,440 hours engaged in various forms of search activity including man-hours plus automatic cameras and automatic sound-recording devices. Cornell went on to expand their search (increasing man and remote sensing hours) sending teams to Florida and Louisiana and through 2009 – the latest results I’ve found, their searches have produced no definitive proof of ivory-billed woodpeckers. So where does that bring us to today? Private, individual searchers continue to find ivory-billed woodpeckers. Some have even produced their own blurry videos. Yet done have produced any kind of clear images and none have been able to take researchers back and document sightings. When this saga began a lot was made about not being able to prove a negative – in other words there is no way to prove that ivorybills are extinct, I mean we can’t have someone under every tree at the same time, right? But it looks like the scientific community has decided to take on the challenge. 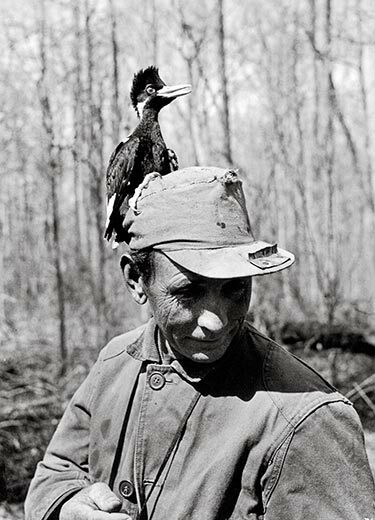 July 2011: Dr. Nicholas J. Gotelli, University of Vermont, et al publishes “Specimen-based modeling, Stopping Rules, and the Extinction of the Ivory-billed Woodpecker.” Gotelli put the odds at finding a live ivory-billed at less than 1 in 15,625. I hear the ringing call of another iconic woodpecker in my ears – ha-ha-ha-HA-ha! ha-ha-ha-HA-ha! ha-ha-ha-ha-ha.